Matt Jameson Evans is a UK doctor and co-founder of HealthUnlocked.com. His background is in orthopaedic surgery and medical politics. He trained in Guys, Kings + St Thomas’ Hospital, and the Royal National Orthopaedic Hospital, London (1995-2008). In 2006 he founded the online Doctors Organisation ‘Remedy UK’ and quickly generated a following of 15,000 UK doctors, lobbying medical issues in the Houses of Parliament and throughout the UK mainstream media. 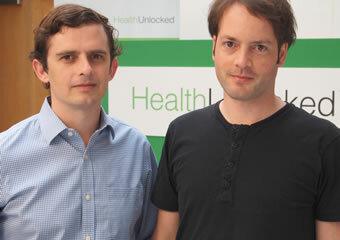 In 2008 he co-founded HealthUnlocked with business partner Jorge Armanet. HealthUnlocked is a health technology company that partners with patient organizations, healthcare providers and industry. It uses online tools to support patients as well as health care providers and generates real world data regarding the effectiveness of clinical services and treatments. What was it like to make the leap from clinical practice into entrepreneurship? The first two years were really difficult. Jumping out of medicine into entrepreneurship is not easy. It’s quite a big hill to get over for medics. You have to unlearn the institutional mentality and culture of medicine. You’re taking a risk with all those years of training and in the early stages everyone looks at you as though you’re a freak. But MMC (modernising medical careers) was such an awful situation that the risk of leaving actually seemed fairly low to me at the time. So how did you go about making that leap? My first organisation was called Remedy UK. I co-founded it amidst the chaos of MMC to support junior doctors and their views. We were seen as freaks at first of course, but not for long. Pretty quickly 10,000 junior doctors had joined and the BMA was taking notice. For me that was a crash course in creating an organisation – building the structure, doing PR, talking to government and so forth. At that time I was in a research post and luckily I had a supportive boss who let me spend a lot of time working on the project. The important thing was making a commitment to see the idea through, despite others’ doubts. As an entrepreneur you may face anything from a few weeks to many years of difficulty before people accept you and what you are doing. The length of time varies but it does take self-belief to work through those times. You really can achieve what you want to do with persistence though, so it’s important to just keep going. Following the success of Remedy UK, how did you come up with the idea for HealthUnlocked? I saw a big gap for a patient-centred service that addresses clinical needs from the patient’s perspective, whilst still maintaining that connection with physicians. I saw that technology was the only way to deliver this. People had been talking about it for ages; doing something patient-controlled and social. The tools were available but nobody was doing it. It just seemed like a great idea. I was also frustrated with technology in hospitals and the time it takes to achieve anything and I could see the only way to create this kind of service was to go out and do it ourselves. I already knew Jorge as we’d met back in 2004. He’d been at Judge Business School in Cambridge and had lived in London. He was someone with complimentary skills to my own and he’d been doing interesting things in Chile but was ready to come back to London. It was serendipity really – great timing from both of our perspectives. I had used my own savings to do a pilot project called NHS Unlocked. Together we used this to get feedback with the aim of doing something bigger. How did you find running your own company different to practising clinical medicine? As a medic, running a business was definitely a culture shock. You really have to prove yourself. You’re always having to ask others to trust you. That’s an alien concept to most medics as we’re used to being in a position of responsibility and authority in which, for the most part, people’s trust is automatic. On top of that, your idea has not been done before and everything is uncertain. After the Remedy experience I expected Health Unlocked to take off quickly but it was a tougher journey than I’d anticipated. You’re competing with big players and it’s very competitive. It’s a difficult journey for a medic as we’re not trained to work in that way. However, I’d say to any medics considering a similar move – it’s worth it. You are in a unique position, understanding healthcare from the medic’s perspective. There aren’t many people out there like you. So go for it. What was it that kept you going during the tough times? We had a big long-term vision. We were trying to do a lot of things and there were long periods of just knocking on doors and talking to anyone and everyone with little reward. However, that big vision and the thought of what we could achieve in the longer term kept us going. How did you fund those very early stages? At the beginning I was doing a LAT (locum appointment for training) in Orthopaedics at SpR level. I continued locuming throughout the NHS online project to keep some money coming in and three of us self-funded the pilot, putting in about £25,000 between us. We got started with just one developer, who worked on design as well as the back end, and all the funds were used to pay them. Following that pilot we got some seed investment from angels. It was at that point that Jorge came back to the UK and we started working on it full time. We worked for nothing for the first few months. We then secured another round of financing a few months later and we’ve done two more rounds since then. It sounds as though financially you were taking some risks and living without much income for some time. Was that tough? Certainly the stakes were high! There were many points in the first 18 months when we could easily have failed. Every month could have been the last. You just have to push through and keep believing it’s possible. Sheer dogged persistence is essential. How did you go about forming your team? We have a young team. The average age is 27. Most of them started out with us as inexperienced developers and have since grown into experts at what they do. So it’s been a real learning process for everyone. Career development and opportunities for the team to be challenged and to grow professionally are really important motivators in a startup and we’ve tried to offer that to all of our team. Of course, building the right team is an ongoing process – hiring more great developers in order to grow the team is a continual challenge! What’s been the toughest challenge so far? Getting our first 3000 patients was really hard. Finding the early adopters, then satisfying those early customers and rewarding them. Because we’re running a business with network effects, it’s really difficult to provide the service you envision before there’s a large base of users. What’s your top tip for aspiring medic entrepreneurs? Get yourself a co-founder – someone with complimentary skills to your own. What do you wish you’d known when starting out? I wish I’d known how to sell better. On the whole, medics aren’t used to selling. Looking back, there were many times when I could have done a better job of selling our concept and there were probably many deals and opportunities we missed out on as a result! To any medic entrepreneurs out there, I’d say find someone with great selling skills to join your team.